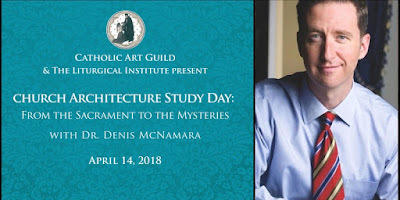 A reader asked me to publicize a one-day event coming up this Saturday, which looks like a great opportunity for Catholics, especially clergy, who wish to learn more about beautiful church design and how it relates to the nature and needs of the liturgy. The event is co-sponsored by the Catholic Art Guild and the Liturgical Institute. To register, visit here. Wednesday evening (4/11) is the cut-off for registrations. Join Dr. Denis McNamara for a one day immersion of church architecture from a Catholic perspective. The cost of the program includes a lunch buffet of sandwiches, salad, coffee and dessert. Clergy and seminarians attend for free. Lunch orders will take place 48 hours prior to the event. Please email info@CatholicArtGuild.org with any questions; visit here to register.